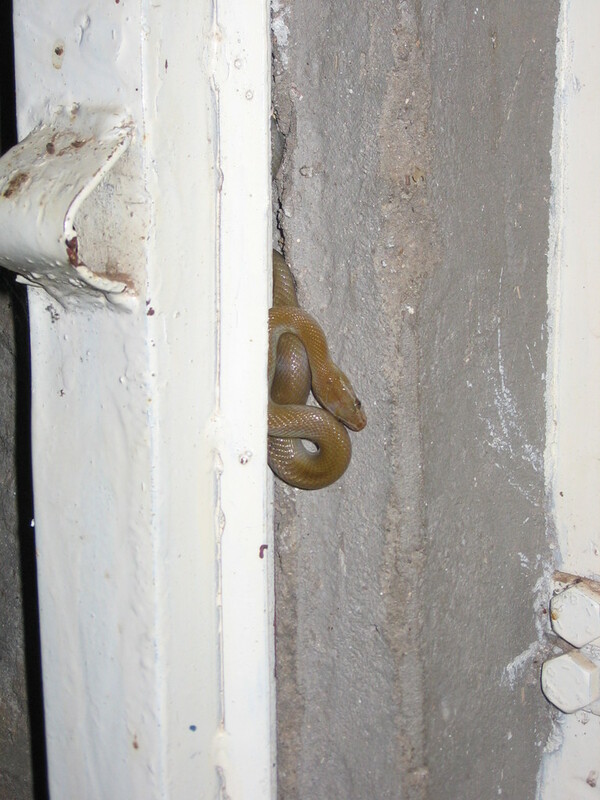 I thought I saw something the other night (I even tried to poke it), but now I’m sure… there’s a snake living in and or above the front door of my house. When I saw it a few nights ago it was high above my door in some little crevice in the bricks of my house. I know it’s a small little thing, but maybe it was hunting that huge, furry spider from earlier this week. I know you guys wouldn’t believe me unless I had hard evidence, so I snapped a quick photo. I never knew snakes could climb on vertical rock walls and, unless it’s a snake/lizard hybrid, I am actually stumped as to how it got there. On a related note, I had a large stick insect on my curtain tonight as well. I don’t know what’s with the influx of creepy, crawly, slithery things lately, but maybe my prayer flags are just doing their thing. I’ll have you know that, other than shooing the spider and poking the snake, none of these critters have been harmed. Wow, that snake is much larger than I expected. Is there any antivenom in your village? Oh My God Alan. You are braver than me. I think I would run around screanming then die if I had a snake in my house. Haven’t really seen many snakes here in Malawi. There are reportedly black mambas here…although it seems that EVERY snake is a black mamba, or a green mamba so I’m not sure how many there actually are. I hope you can get rid of it. Wouldn’t be nice to find him cuddled in your bed one night. Photo taken about 1.5M away from where your photo was taken.